Benetti’s new Seasense has twin 1,850-hp Caterpillar engines that push the superyacht to a top speed of 15.5 knots. Benetti is presenting its new 220-foot custom superyacht Seasense at the Monaco Yacht Show, which starts today and runs through Saturday. Built at the company’s Livorno shipyard, the vessel has a steel hull and an aluminum superstructure. 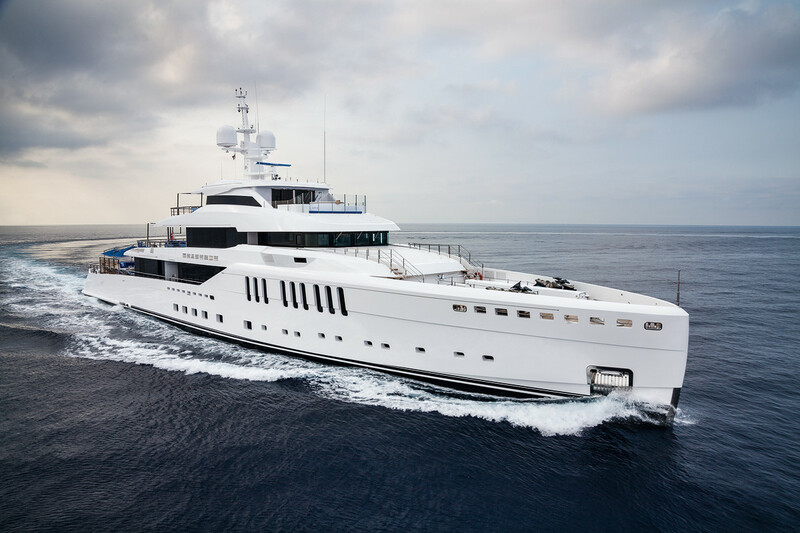 The exterior was drafted by Dutch designer Cor D. Rover, who worked with Benetti for the first time. Among the design innovations are the Benetti Beach Concept on the main deck, in which the stern section has a 32.8-foot by 13.1-foot pool that can be covered with carbon fiber and teak planks to create a basketball court. Additionally, the main deck has an indoor-outdoor area with a table for 12 that connects the outdoor space with the indoor TV lounge through sliding doors. Floor-to-ceiling windows open and the cutaway gunwales offer unobstructed views. The Los Angeles-based firm Area worked with Benetti on the interior, which can accommodate as many as 12 people. On the main deck, the owner’s apartment has a chaise lounge, twin walk-in closets and a head with a shower and tub. The VIP cabin is to starboard. Belowdecks, four guest cabins have en suite heads. On the upper deck, a second saloon is split into a living area, an office space and a bookcase plus another day area aft with sofas and sun loungers. The dining area is in a circular veranda with 12-person table. The sun deck has a covered, fully appointed gym with access to the conversation area, which has sofas, an American bar and a wood-burning pizza oven. A centrally located garage contains a limo-tender designed by Giorgio Cassetta. Twin 1,850-hp Caterpillar engines push Seasense to a top speed of 15.5 knots. The yacht’s range is 5,000 nautical miles at a cruise of 12 knots.